For a long time now, I have wondered what goes on in the heads of the Metropolitan Opera management, and their insistence on "updating" classic and beloved operas. There's nothing really wrong with that, as long as the composer's and librettist's intent is respected. Unfortunately, this has not been the case since the idiotic likes of Peter Sellars has been turned loose on the opera world. The new production of "Faust," is no exception. An old story of the battle of the struggle between good and evil, this opera offers some of the most wonderful, lush, soaring music and some cynical musical observations ever put on stage, wrapped in an age-old drama of passion and bad decisions. Innovative ideas are one thing, but this production by Des McAnuff indulges in grotesque and disgusting effects that go way beyond innovation. I agree with the critic who observed that the best thing to do is close your eyes and listen, and he was absolutely right. The Walpurgis Night scene reached a new low of ugliness with creatures looking like zombies (of all things) having a garbage banquet. It was noted that the singers rarely looked at them, and one can't blame them. 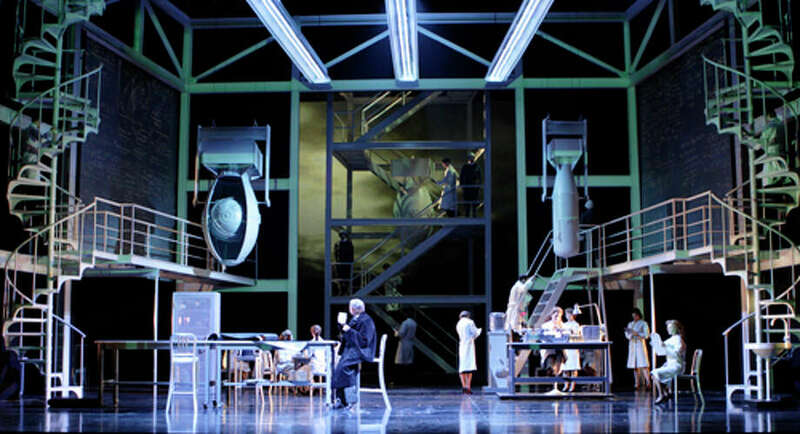 The set began as a laboratory, with a lethal looking set of balconies and staircase. Everything was sparse, cold, gray and white, and unattractive. Dr. Faust arrived as -- are you ready?-- a guilt-ridden atomic scientist, who wants to be young and makes a deal with you-know-who. He has a passionate affair with an innocent young girl, Marguerite, who is treated very badly by everyone. Sadly enough, they really love each other and are kept apart. She becomes pregnant, is shunned (always blame the woman,) cursed by a moralistic brother and goes mad and kills her child. Usually, this is inferred -- this time she was shown drowning the baby --another nice little directorial touch. Yes, the devil gets Faust, but not Marguerite, who is forgiven. Dr. Faust is shown once again in the laboratory on the edge of suicide, which he completes. That was the one moment that made theatrical sense. Was it all a dream after all? That's the bad stuff. The singing was flat-out wonderful. The title role was sung by the outstanding young tenor Jonas Kaufmann, who at one point sang a diminuendo on a long high note, on the phrase "Je t'aime," (I love you) a stunning feat. Very handsome and a fine actor, totally believable, he gave one of the best performances of this role in a long time. Marguerite was soprano Marina Poplovskaya, a sweet-voiced soprano with a wide range and clear understanding of her character. The director tried to make her almost a simpering non-entity, but he did not succeed. She was excellent, and in the soaring Redemption, triumphant as she was forgiven. Rene Pape was a marvelous Devil, Mephistpheles, looking nattily overdressed and groomed like a Chicago gangster, but intrinsically evil from the moment he walked onto the stage. He is a wonderful bass, with a generous sound which he offers as if weren't work at all. The unforgiving brother, Valentin, was very well-done by Russell Braun. You didn't like him a bit. Marguerite's very young, sadly spurned suitor was Michèle Losier, an excellent mezzo, and Wendy White sang the role of Marthe, Marguerite's loyal nurse, whose flirtation with the Devil was one of the few witty moments in the afternoon. I felt sorry for the Met chorus and dancers when they had to appear in the nightmarish costuming, but they were very good the rest of the time. The conductor, Yannick Nèzet-Sèguin, led the first-class Met orchestra in this magnificent score, to which everyone on the stage more than did justice, especially when we closed our eyes, and listened. Wendy White fell from the dangerous-looking stairs the other evening at another performance of "Faust, but apparently is in stable condition after being taken to the hospital. Do not, repeat, do not think about taking children to see the new production of "Hansel and Gretel." Yet another ugly travesty on a beautiful opera. The subtitle of this production should be "Children's Day in Dachau!" There will be another performance of "Faust" at the Metropolitan Opera on Dec. 28.